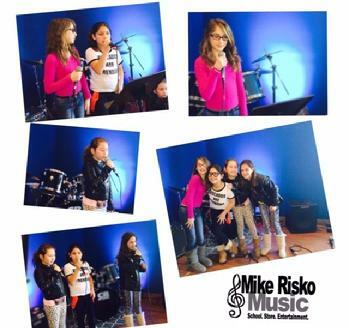 The Rock Star Vocal Program at Mike Risko Music are group voice classes which teach healthy singing techniques that are unique to singing contemporary music. The classes also focus on performance techniques and equipment that is essential for the pop/rock singer. Through vocal exercises and use of popular music, singers learn important fundamentals of singing while building strength and stamina. These classes meet weekly for one hour. Students sing popular songs chosen by a seasonsed coach which they rehearse and perform in class and on stage. Students also study microphone technique and learn about equipment essential for singing live. These classes are also great for the singer who wants to sing contemporary musical theatre. Today's musical theatre performers must be skilled at singing with a microphone and also singing more pop and rock music since there are so many musicals in this genre now. They also must be ready to be challenged vocally and to know how to sing with strength and stamina. In addition to vocal skills, students gain confidence through performances. Each session wraps with a final performance for all students. Select students are often chosen from these groups to perform as a part of our Risko Rocks performance group at festivals, fairs and other public performances.Regular classes are offered for ages 8 and up while Pre-k and K singers and 1st and second graders can participate in our Rock Star Jr Classes. Singers progress at their own rate and all levels from beginner to advanced are welcome. Voice lessons are recommended but not a requirement. This class meets in sessions. This class is designed to help singers build up their confidence on stage. For information on this class please contact us. For current registration information, please go to register. Miss Elena works with one of our Mini Rocker Classes as they work on Disney Songs. Miss Miriam works with a Mini Rock Star group on Here Comes the Sun for their performance. Classes are held in our "Rock Star Zone" which is a real stage with sound equipment and lights.